Neuschwanstein Castle (German: Schloss Neuschwanstein, pronounced, English: “New Swanstone Castle”) is a 19th-century Romanesque Revival palace on a rugged hill above the village of Hohenschwangau near Füssen in southwest Bavaria, Germany. The palace was commissioned by Ludwig II of Bavaria as a retreat and in honour of Richard Wagner. Ludwig paid for the palace out of his personal fortune and by means of extensive borrowing, rather than Bavarian public funds. The castle was intended as a home for the king, until he died in 1886. 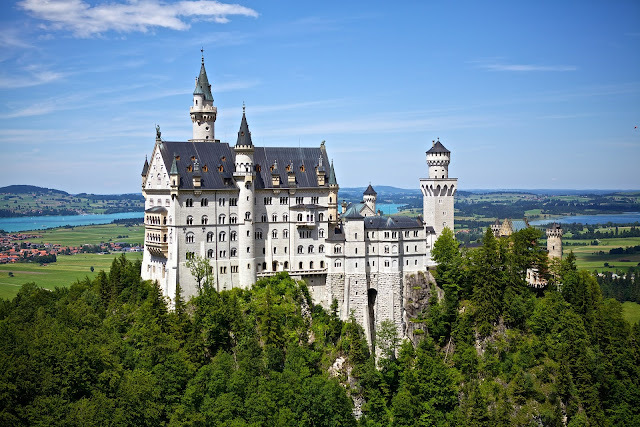 It was open to the public shortly after his death.Since then more than 61 million people have visited Neuschwanstein Castle. 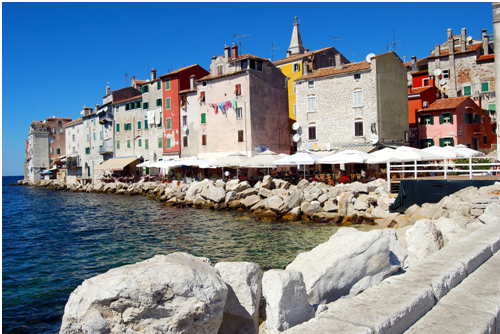 More than 1.3 million people visit annually, with as many as 6,000 per day in the summer. (Slovene: Predjamski grad or grad Predjama, German: Höhlenburg Lueg, Italian: Castel Lueghi) is a Renaissance castle built within a cave mouth in south-central Slovenia, in the historical region of Inner Carniola. It is located in the village of Predjama, approximately 11 kilometers from the town of Postojna and 9 kilometers from Postojna Cave. According to legend, Erazem came into conflict with the Habsburgs when he killed the commander of the Imperial army, Marshall Pappenheim, who had offended the honour of Erazem’s deceased friend, Andrej Baumkircher of Vipava. 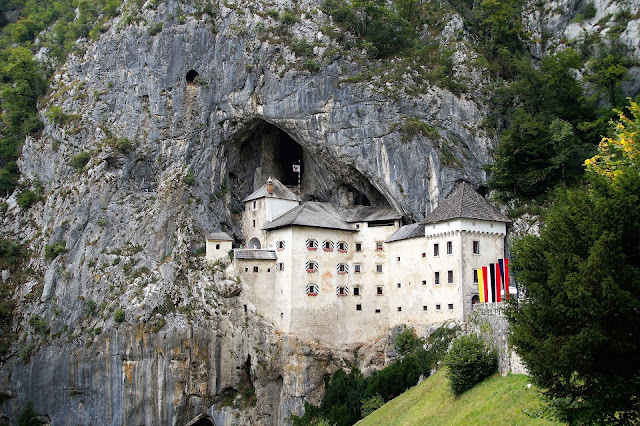 Fleeing the vengeance of the Holy Roman Emperor Frederick III, Erazem reached the family fortress of Predjama. From there, he allied himself with King Matthias Corvinus and began to attack Habsburg estates and towns in Carniola. The emperor commissioned the governor of Trieste, Andrej Ravbar, with the capture or killing of Erazem. Erazem was killed after a long siege. Erazem was betrayed by one of his men and was killed by a shot from a cannon. Bran Castle (Romanian: Castelul Bran; German: Törzburg; Hungarian: Törcsvár), situated near Bran and in the immediate vicinity of Brașov, is a national monument and landmark in Romania. The fortress is situated on the border between Transylvania and Wallachia, on DN73. Commonly known as “Dracula’s Castle” (although it is one among several locations linked to the Dracula legend, including Poenari Castle and Hunyadi Castle), it is often erroneously referred to as the home of the title character in Bram Stoker’s Dracula. There is, however, no evidence that Stoker knew anything about this castle, which has only tangential associations with Vlad the Impaler, voivode of Wallachia, the putative inspiration for Dracula. Dutch author Hans Corneel de Roos, proposes as location for Castle Dracula an empty mountain top, Mount Izvorul Călimanului, 2,033 meters (6,670 ft) high, located in the Călimani Alps near the former border with Moldavia. 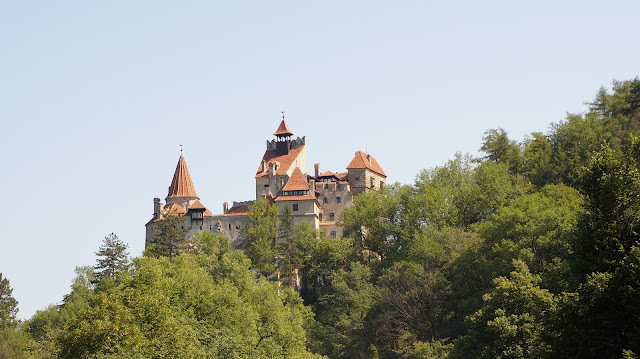 Stoker’s description of Dracula’s crumbling fictional castle also bears no resemblance to Bran Castle. The castle is now a museum dedicated to displaying art and furniture collected by Queen Marie. Tourists can see the interior on their own or by a guided tour. At the bottom of the hill is a small open-air museum park exhibiting traditional Romanian peasant structures (cottages, barns, etc.) from across the country. Edinburgh Castle is a historic fortress which dominates the skyline of the city of Edinburgh, Scotland, from its position on the Castle Rock. 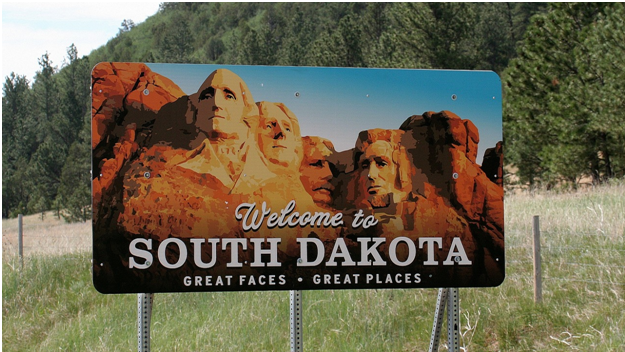 Archaeologists have established human occupation of the rock since at least the Iron Age (2nd century AD), although the nature of the early settlement is unclear. There has been a royal castle on the rock since at least the reign of David I in the 12th century, and the site continued to be a royal residence until 1633. From the 15th century the castle’s residential role declined, and by the 17th century it was principally used as military barracks with a large garrison. Its importance as a part of Scotland’s national heritage was recognized increasingly from the early 19th century onwards, and various restoration programs have been carried out over the past century and a half. 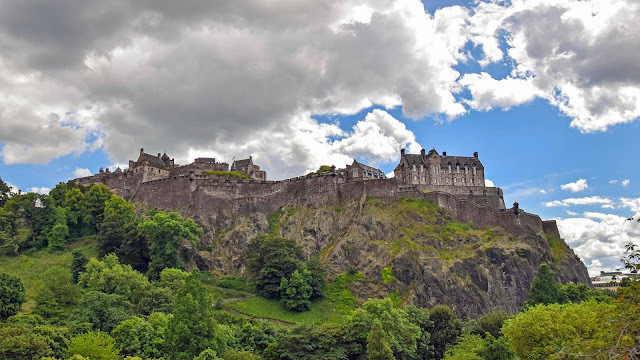 As one of the most important strongholds in the Kingdom of Scotland, Edinburgh Castle was involved in many historical conflicts from the Wars of Scottish Independence in the 14th century to the Jacobite rising of 1745. Research undertaken in 2014 identified 26 sieges in its 1100-year-old history, giving it a claim to having been “the most besieged place in Great Britain and one of the most attacked in the world”. Egeskov Castle (Danish: Egeskov Slot) is located near Kværndrup, in the south of the island of Funen, Denmark. 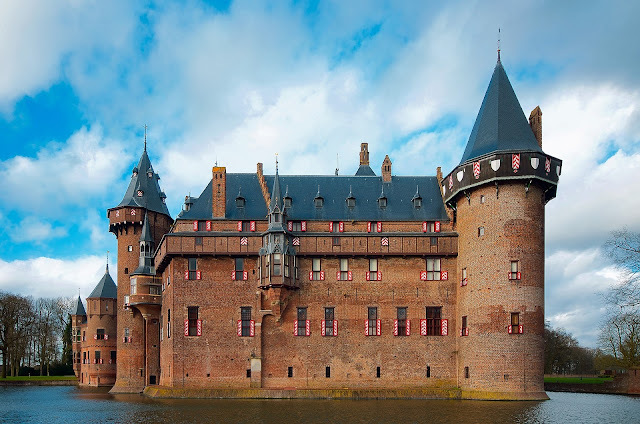 The castle is Europe’s best preserved Renaissance water castle. 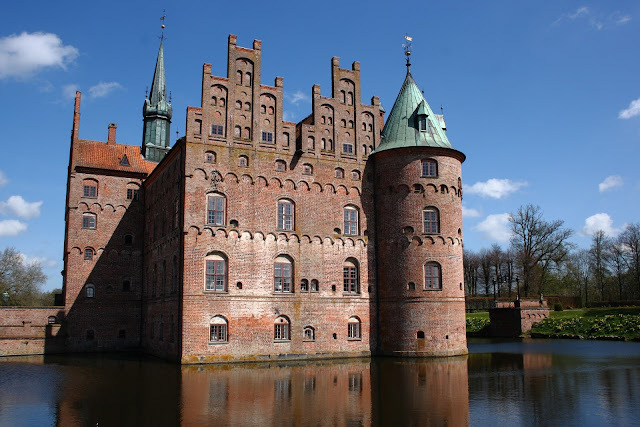 Egeskov was first mentioned in 1405.The castle structure was erected by Frands Brockenhuus in 1554. Due to the troubles caused by the civil war known as the Count’s Feud (Danish: Grevens fejde), general civil unrest, and a civil war introducing the Protestant Reformation, most Danish noblemen built their homes as fortifications. The castle is constructed on oaken piles and located in a small lake with a maximum depth of 5 meters (16 ft). Originally, the only access was by means of a drawbridge. According to legend, it took an entire forest of oak trees to build the foundation, hence the name Egeskov (oak forest). Loir-et-Cher, at Chambord, Loir-et-Cher, France, is one of the most recognizable châteaux in the world because of its very distinctive French Renaissance architecture which blends traditional French medieval forms with classical Renaissance structures. The building, which was never completed, was constructed by King Francis I of France. Chambord is the largest château in the Loire Valley; it was built to serve as a hunting lodge for Francis I, who maintained his royal residences at the Château de Blois and Amboise. The original design of the Château de Chambord is attributed, though with some doubt, to Domenico da Cortona; Leonardo da Vinci may also have been involved. Chambord was altered considerably during the twenty-eight years of its construction (1519–1547), during which it was overseen on-site by Pierre Nepveu. 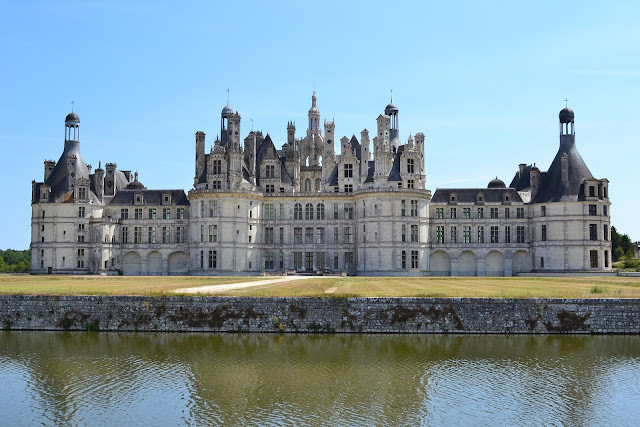 With the château nearing completion, Francis showed off his enormous symbol of wealth and power by hosting his old archrival, Emperor Charles V, at Chambord. In 1792, in the wake of the French Revolution, some of the furnishings were sold and timber removed. For a time the building was left abandoned, though in the 19th century some attempts were made at restoration. During the Second World War, art works from the collections of the Louvre and the Château de Compiègne were moved to the Château de Chambord. The château is now open to the public, receiving 700,000 visitors in 2007. Flooding in June 2016 damaged the grounds but not the château itself. 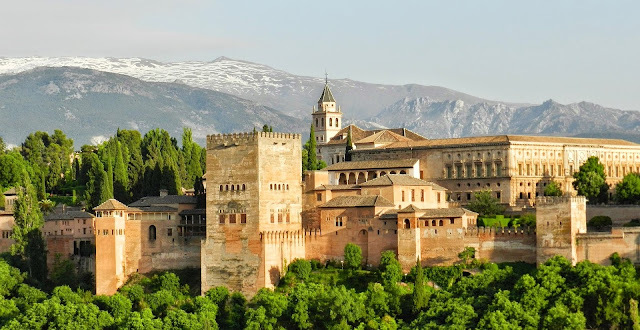 “The Red One”,the complete Arabic form of which was Qalat Al-Hamra)is a palace and fortress complex located in Granada, Andalusia, Spain. It was originally constructed as a small fortress in AD 889 on the remains of Roman fortifications, and then largely ignored until its ruins were renovated and rebuilt in the mid-13th century by the Nasrid emir Mohammed ben Al-Ahmar of the Emirate of Granada, who built its current palace and walls. It was converted into a royal palace in 1333 by Yusuf I, Sultan of Granada. After the conclusion of the Christian Reconquista in 1492, the site became the Royal Court of Ferdinand and Isabella (where Christopher Columbus received royal endorsement for his expedition), and the palaces were partially altered in the Renaissance style. In 1526 Charles I & V commissioned a new Renaissance palace better befitting the Holy Roman Emperor in the revolutionary Mannerist style influenced by Humanist philosophy in direct juxtaposition with the Nasrid Andalusian architecture, but it was ultimately never completed due to Morisco rebellions in Granada. Pena Palace (Portuguese: Palácio da Pena) is a Romanticist castle in São Pedro de Penaferrim, in the municipality of Sintra, Portugal. 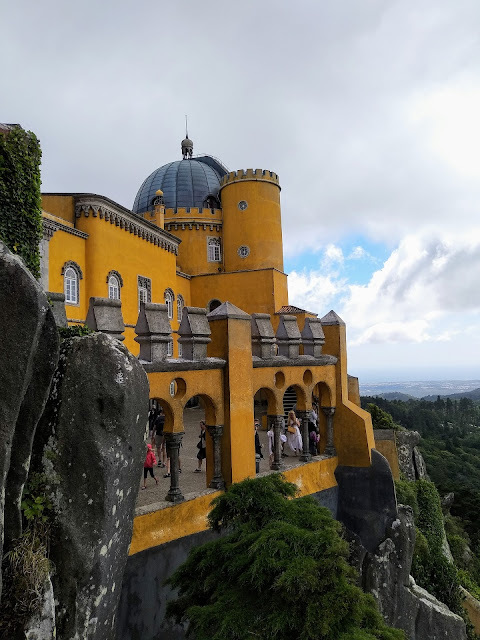 The castle stands on the top of a hill in the Sintra Mountains above the town of Sintra, and on a clear day it can be easily seen from Lisbon and much of its metropolitan area. It is a national monument and constitutes one of the major expressions of 19th-century Romanticism in the world. The palace is a UNESCO World Heritage Site and one of the Seven Wonders of Portugal. It is also used for state occasions by the President of the Portuguese Republic and other government officials. Windsor Castle survived the tumultuous period of the English Civil War, when it was used as a military headquarters by Parliamentary forces and a prison for Charles I. At the Restoration of the monarchy in 1660, Charles II rebuilt much of Windsor Castle with the help of the architect Hugh May, creating a set of extravagant Baroque interiors that are still admired. After a period of neglect during the 18th century, George III and George IV renovated and rebuilt Charles II’s palace at colossal expense, producing the current design of the State Apartments, full of Rococo, Gothic and Baroque furnishings. Queen Victoria made a few minor changes to the castle, which became the center for royal entertainment for much of her reign. 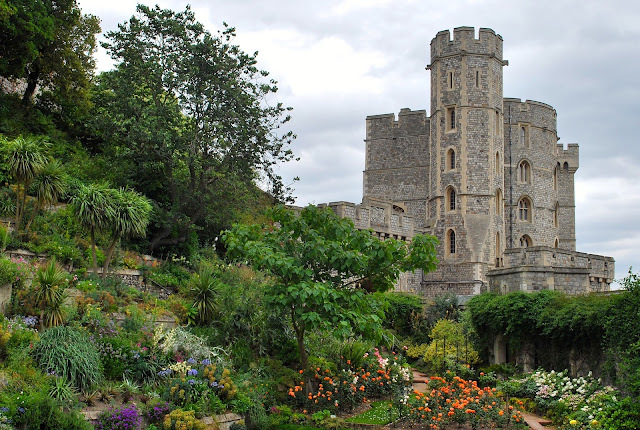 Windsor Castle was used as a refuge by the royal family during the Luftwaffe bombing campaigns of the Second World War and survived a fire in 1992. It is a popular tourist attraction, a venue for hosting state visits, and the preferred weekend home of Elizabeth II.